There was Jesus on the worst night of his life, knowing that horror was just hours away. 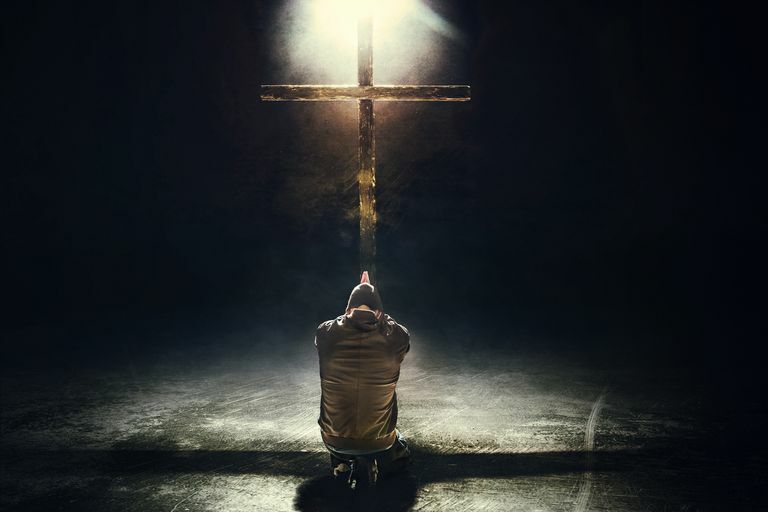 He is kneeling, praying to God, experiencing human pain and anxiety, wishing like we all do that there might be another way, some escape from suffering. What do you when you don’t want to do what God wants you to do? You do what Jesus did. That’s what Peter teaches next. What did Jesus do? Let’s find out. Peter’s third and final illustration of the principle “submit to human created authorities, for God’s sake” is found in in verses 21-25 of 1 Peter 2. That means Christians will live in a way that is different. Christians submit to and respect human authorities, even when those authorities mistreat you. And then every moment throughout the day, live that kind of life, for God’s sake. Throughout each day, who knows what we will be faced with? Meanness? Unkindness? Difficult situations? How will we react? Will we take up arms and try to maim and injure and hurt back? Will we take to social media and try to destroy? Will we unleash venom from our tongues? Peter says, “Live good lives. Be respectful.” The way of the world is to erupt and rage and react with vengeance. Peter says that is unbecoming of a follower of Jesus. Stay focused on Jesus, our example. In the face of intense persecution at his arrest and crucifixion he did not retaliate. Peter was there! He saw how Jesus handled it. Of all people, Jesus had the right to retaliate and call down fire from heaven. But he did not. Yes, this is hard teaching to swallow. Is Peter saying that we should just take abuse if we are being abused? No! You have to remember that it was a different cultural situation. Peter was talking to slaves who were Christians. Peter was talking to Christians who were being persecuted. Facing severe bodily mistreatment was a real possibility in their daily lives. Peter wasn’t saying that the abuse was okay or justified. Peter was simply speaking to a situation that was their daily reality. You and I don’t live in that situation. In our culture, abuse is illegal and wrong, as it should be. We have legal recourse and means to deal with abuse. First, get away from it. Second, take appropriate legal action. But in the midst of our response to abuse, we can still apply the principle: be respectful and considerate for God’s sake. Make the mission of the God your priority, even when you are being abused. But how do we know if we Christians should stop respecting and obeying our government? What would we do, for example, if America outlawed evangelism like they did in Nepal last year? What will our Nepalese sister churches do? I will tell you what we will do, and what our sister churches have already started doing. We’ll do what Peter said to do: “Obey God rather than men.” I pray we never have to make that choice. But there are plenty of places around the world, like Nepal, where this is an issue. That’s why there are underground churches all around this world. So while we praise God we are living in a country where we are free to worship and to speak our opinions, let’s communicate in respectful, God honoring ways. As Peter reminds us, we Christians are not really free to do as we please. We are, like Jesus, bound to the mission of God. As much as possible, we submit ourselves, we bind ourselves to obey and respect all authority, so that the cause of Christ might advance. Are you facing a situation where you are being mistreated? How will you respond with respect to that authority, for God’s sake?